What was the colour of brown beer in the 19th century? When working on my upcoming e-book about historic beers, one particular aspect of recreating historic beers crept through my mind: how similar or different are modern malts compared to malts that were produced 100 to 200 years ago? The biggest improvements in malting technologies, in particular kilning, happened in Continental Europe within the last 200 years: while smoke kilns used to be widespread, Bavarian breweries started adopting modern, smoke-free kilns about 200 years ago, and in the 1830’s, Gabriel Sedlmayr and Anton Dreher brought back more knowledge about how to produce pale malts from the UK back to Continental Europe. The 1840’s were the beginning of pale lager beers which eventually became the world-wide standard for mass beer production around the world. But one particular aspect kept bugging me: what did the colour of brown beers use to be like 100, 200 years ago? Here, by brown beer, I mean all beer made from kilned malt. The romantic notion is of course a deep brown beer, made from a highly dried malt, almost bordering on porter. But how can we get closer to the truth? It’s not like we can just look up photos of beers back then. Or can we…? Well, not photos, but there’s a similar source: let’s take a closer look at art of that time. 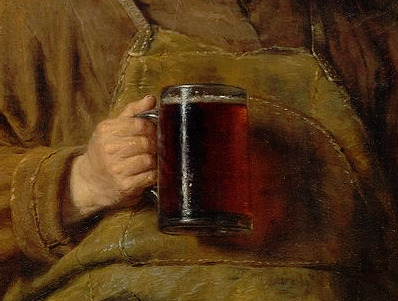 If we assume that painters who focused on a certain realism in their paintings took care of getting their colours right, then we can expect a realistic and reasonably consistent portrayal of the colours of brown beer. So let’s go through a few examples. 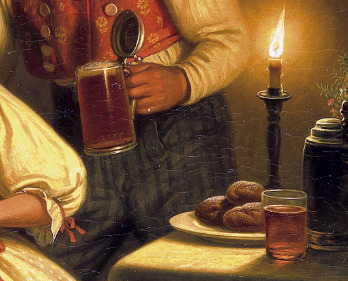 This first example is from a painting depicting a Bavarian pub scene in 1855. 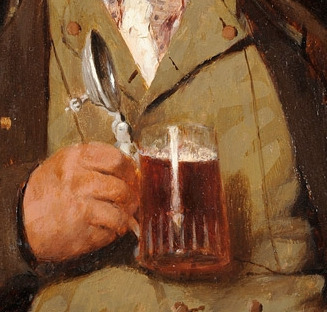 One man holds a glass of reddish-brown beer with an off-white head. It’s not clear whether the glass on the table also contains beer, but if it is, looks slightly paler due to the smaller size of the glass. 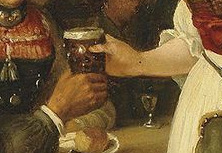 This example shows a Stammtisch scene from 1872 with the waitress handing the customer a glass of dark brown, almost black beer, with a distinctly white head. This picture from 1877 again shows a bright, reddish-brown beer, almost bordering on a dark amber. …and the same goes for these examples from 1885, 1888 and 1912. Noticeable in all three is a kind of glow, coming from a bright beer served in glassware, which, in my opinion looks mouthwatering. I would happily want to try one of these beers! 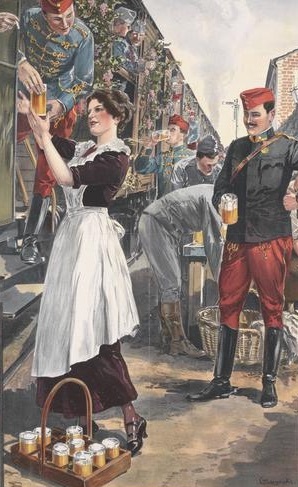 The last two examples are slightly different: both from 1916, they show Austrian-Hungarian soldiers being served beer. The beer has an amber to golden colour, and is distinctly paler than in the other pictures that I showed here. 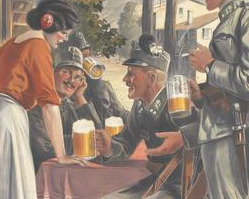 Both are from brewery ads (the top one from the Hungarian Dreher brewery, the bottom one from Hütteldorfer brewery, Vienna), and mostly reflect the ongoing change in beer fashion at that time, while the previous examples are mostly from pictures painted by artists situated in Bavaria, where brown beer remained fashionable for longer than in most other places. 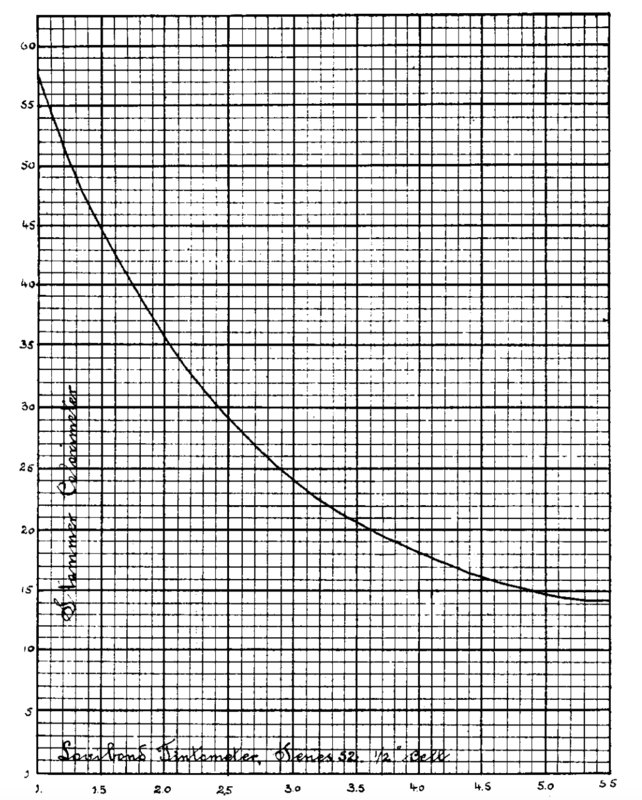 When we compare modern dark beers (in particular Bavarian ones) with those from 100 to 150 years ago, visually it seems like there is not really a difference. If anything, I’d say that the old beers in these examples may even have been a tad paler than the modern varieties. Now what conclusions can we take from that, in particular for recreating historic beers? Well, the number one takeaway for me is that brown beers back then were mostly the same colour as today, which means that if I wanted to recreate an old beer recipe from that era, I could assume within reason that the colour of dark (Munich) malt nowadays is the same or very similar to how it used to be 100, 150 years ago. For historicity’s sake, the beer would also need to be as bright as on the pictures above: no haze in these beers. 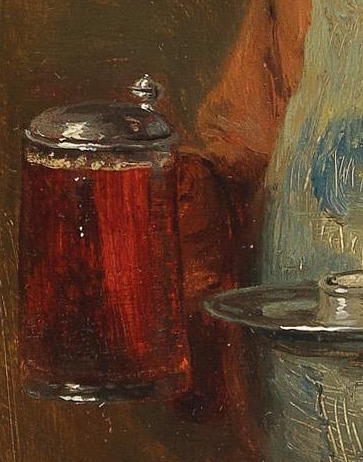 And finally, but that’s more of a minor detail: look at the drinking vessels at that time. 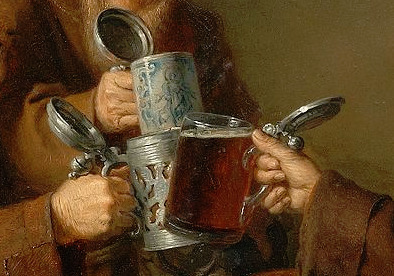 While the Steinkrug (earthenware mug) is classically associated with historic beer of previous centuries, the art in the 19th century suggests that glassware must have been quite common for beer to be served in. And of course, a lot of the beer mugs have metal lids on them. So, if you think about rebrewing some historic Bavarian brown beer, don’t worry about the malt, just use Munich malt as a dark base malt, and make the beer bright and haze-free, and you’ll be fine.